22 MMS December 2016 mmsonline.com ONE-OFF Commentary Although the title of my column this month reads like the name of a Motorhead song (R.I.P., Lemmy), it actually alludes to the fact that some Modern Machine Shop articles detail the machin- ing of materials other than metals. In fact, we ask about the types of metallic and non-metallic materials shops machine in our annual Top Shops benchmarking survey. (Consider participating in our next survey that goes live next month, which I'll detail in my Januar y One-Off column.) It turns out that a high number of shops machine non-metallic materials. Per this year's survey, 87 percent of all surveyed shops report that they machine general plastics, and 41 percent of companies in the Top Shops benchmarking group machine medical-grade plastics. There are often unique challenges in machin- ing these types of materials compared to metals. Here are a few examples from stories I've written about shops machining non-metallics and some of what I discovered along the way: • PEEK—Polyetheretherketone is fun to say quickly once you get used to it. Its acronym is PEEK, and this plastic material is produced in both industrial and medical grades. The stor y "Under One Roof" ( short.mmsonline.com/dew ) describes Dew Technologies' process for machin- ing medical-grade PEEK. Because it is important to avoid material contamination, this shop dedi- cates the machine tool, fix turing and tools to machining only PEEK. It also insists that operators wear gloves when handling PEEK to keep oils off the part surface. The material is machined dry, using air blast for chip control, and its machin- ability is said to be similar to that of Delrin. • G las s-filled p las t ic s—In some cases, materials such as glass in fiber or mat form are added to plastics to improve insulating properties, dimensional stability and mechanical strength. However, this can lead to dif ficulty machining them. In "The Challenges of Machining Glass- Filled Plastics" ( shor t.mmsonline.com/glass ), K&E Plastics explains that the best cutters for glass-filled plastics have positive rake angles and very sharp cutting edges to cleanly cut glass filler while not burning the resin. Plus, tool coatings such as polycrystalline diamond (PCD) extend tool life in machining of abrasive glass filler. 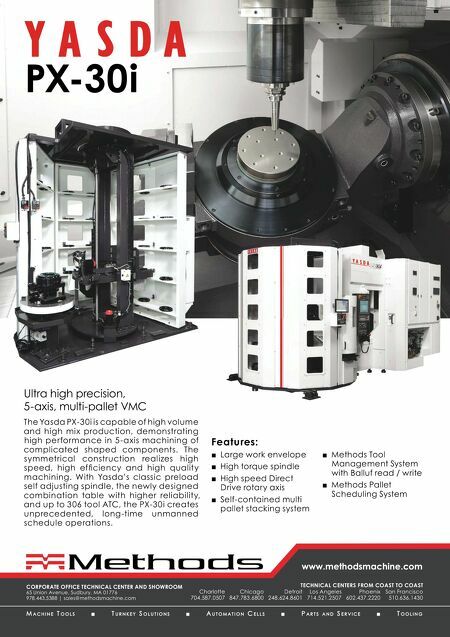 Because machining this material creates tiny chips and a good deal of dust, all the shop's machines are connected to a central cartridge-style dust col- lection system to minimize dust build up on machine components and maintain a clean facility. • CFRP—Carbon-fiber-reinforced plastics are being used more these days, especially for aerospace applications. "Setting the Stage for Sizable Composites Work" ( shor t.mmsonline. com /royal ) de scribe s situations whe n Royal Engineered Composites will use either waterjet or conventional milling operations for CFRP. One advantage of waterjet is that its abrasive garnet media serve as the high-pressure stream's More Than Metal Our magazine doesn't cover only the machining of metals. Here are some interesting tidbits about machining non-metallic materials from a few of my past stories. 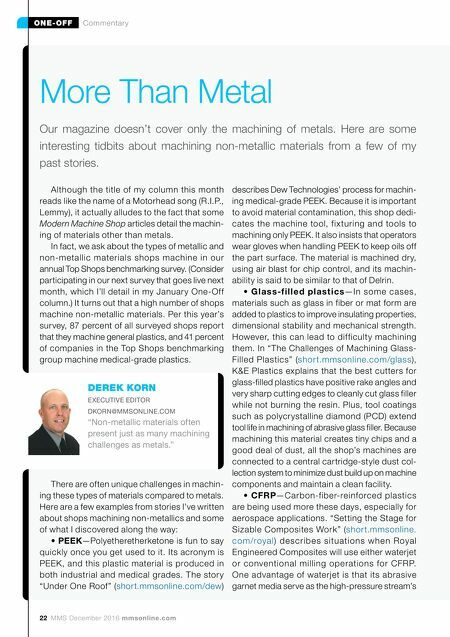 DEREK KORN EXECUTIVE EDITOR DKORN@MMSONLINE.COM "Non-metallic materials often present just as many machining challenges as metals."